Hello and welcome to another one of my ROH TV Reviews for both http://www.EyesOnTheRing.com and http://www.4CRWrestling.com. This week begins the taping from Sam’s Town in Las Vegas after the 14th anniversary show that took place in the same venue. Without any further hesitation, let's get right down to business. Thoughts: Before the match can begin, Veda Scott asks BJ Whitmer if he is willing to surrender his opportunity at the TV Title and give it to Cedric Alexander in order to get paid some extra money. Surprisingly enough, BJ takes Veda’s deal! So, the match turns into Cedric Alexander challenging Tomohiro Ishii for the ROH World Television Championship. Thoughts: The match starts with the two feeling each other out briefly before Ishii runs through Alexander with a shoulder block. Veda pulls on Ishii’s foot from the outside of the ring so that Cedric can get the upper hand and hit a dropkick. Cedric grabs Ishii in a headlock on the ground before picking him up and backing him in the corner and chopping and punching Cedric down in the corner. Ishii pulls Cedric to the center of the ring to hit a brainbuster for a near fall. Ishii headbutts Alexander but Alexander rolls Ishii up with a crucifix for a near fall. The match comes to an end when Tomohiro Ishii hits Cedric Alexander with a brainbuster to score the pinfall victory. Match Result: Tomohiro Ishii defeats Cedric Alexander via Brainbuster to retain the ROH World Television Championship. Not a bad match… but, it could have been a bit better. I’m interested to see how this Tomohiro Ishii title reign goes and how long it lasts. From there we go to a commercial, back from commercial and The Addiction are in the ring talking about the Motor City Machine Guns where Frankie Kazarian says “Lions do not lose sleep over the opinions of sheep.” This is the most interesting thing Kazarian has ever said in the history of, probably, ever. Daniels grabs the mic and goes on to say that they are the generation killers and they want to end the reunion of the Machine Guns. And then, we go to the next match of the night. Thoughts: So…Reno Scum is made up of Luster the Legend and Adam Thronstowe which, if you listened to commentary, you wouldn’t know; they didn’t mention them once by name. The match begins and Mark and Jay begin double-teaming Luster. Jay hits a dropkick for an early near fall while Adam Thornstowe hits a snapmare on Mark and then falls on him with a headbutt for a near fall. Luster the Legend does a catapult and puts Mark on Adam’s shoulders as he hits a Death Valley driver for a near fall. Mark tags in Jay and Jay hits three big clotheslines and follows it up with a Death Valley Driver. Jay Briscoe hits the loud noises neckbreaker for a near fall. Mark comes in allowing for a double team opportunity as the Briscoes hit a powerbomb neckbreaker combo on Luster to get a near fall. Reno Scum comes back and hits a German Suplex Double stomp combination to get a near fall of their own. The match ends when Mark Briscoe comes off of the top rope with the Froggy Bow to score the victory via pinfall. Match Result: The Briscoe Brothers defeat Reno Scum via pinfall after a Froggy Bow from Mark Briscoe. Fun match up. It showed what Reno Scum could do. I’ve seen them perform live in the past and I wouldn’t mind seeing them do more with ROH in the future. From there, we go to the main event of the evening. Thoughts: Nick Jackson starts the match with Michael Elgin and Nick pokes Michael in the eye to start things off. Matt springs Nick into the air and Nick connects with a kick on Elgin. Matt dives to the outside of the ring onto Elgin as we head into commercial break. Back from break and Elgin catches Matt coming off of the top rope he throws him down on the mat so he lands on his feet and then hits a clothesline. Tanahashi comes in the ring to allow for a double-teaming opportunity as they hit a double stalling suplex. The Bucks recover but not for long as Elgin muscles both of them over with a suplex. Tanahashi catches Matt in an abdominal stretch and begins playing air guitar on Matt’s ribs before being hip tossed by Matt so he can escape. On the outside of the ring Elgin gets super kicked by Nick, Nick goes back into the ring and hits a springboard X factor on Tanahashi he then goes to the outside of the ring and tries to hit a moonsault on Elgin but Elgin catches him. Nick is able to escape the grasp of Elgin by delivering a tornado DDT on the outside. Tanahashi hits a cross body off of the second rope. Elgin gets one of the Bucks on his shoulders while catching the other in his arms to deliver the Samoan Drop Fall Away Slam combination. The Bucks recover and hit stereo 450 Splashes on Elgin for a near fall. Tanahashi gets hit with a super kick but he no sells it and hits Nick with a clothesline. Elgin is waiting on his feet and Nick Jackson comes off of the top rope with a 450 Splash attempt but Elgin catches him in midair to hit him with an Elgin Bomb in a really cool spot. The match would finally come to an end when Hiroshi Tanahashi scores the win via pinfall after hitting a High Fly Flow. Super fun main event from Sams Town in Las Vegas as we kick off the ROH 14th Anniversary tapings. Seriously go watch that main event right now. You know that if I’m telling you to do so, it’s gotta be a good match. I don’t even like 3 out of the 4 participants in said match. This show was very solid and we are back to the three-match formula for now and I hope that’s something that ROH sticks with because four matches is way too much for an hour. That, however, will do it for me and another one of my ROH reviews for http://www.EyesOnTheRing.com as well as http://www.4CRWrestling.com Thanks for reading and make sure to follow me on Twitter @Headliner5 and let’s talk some wrestling. 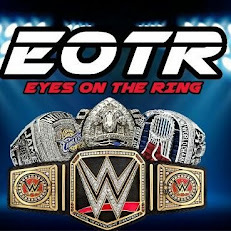 Last but certainly not least make sure to follow both @EyesOnTheRing and @4CRadio for all of your wrestling needs and I will see you right back here next week for another review of another action packed hour of wrestling.